What is the privacy issue suggested for big data analytics in advertising scene? Big Data Analytics is the process of examining large or complex data sets that traditional data processing applications are inadequate to deal with them; and to uncover hidden patterns, unknown correlations, market trends, customer preferences and other useful audience information. 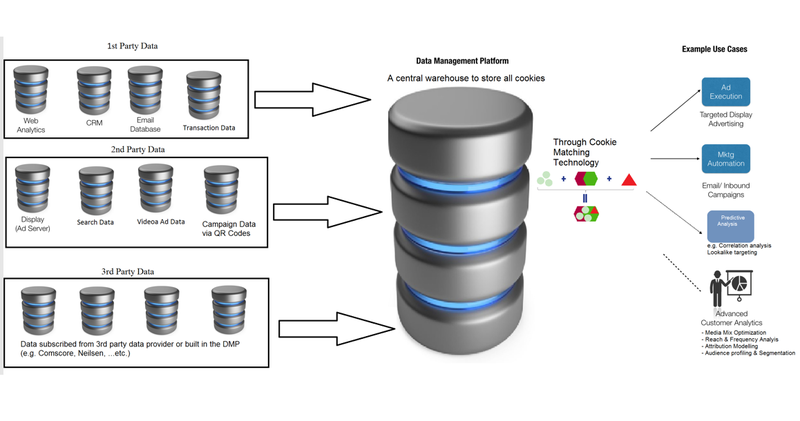 In the context of advertising and marketing, Data Management Platform (DMP) is one of the major big data analytics tool. DMP is a central warehouse to store all audience data in the format of cookies from 1st party data (client’s internal data), 2nd party data (data from advertising and promotional campaigns) and 3rd party data (subscribed from external sources). Based on analytics through cooking matching technologies, many valuable use cases can be built such as more advanced audience profiling and segmentation, optimization across media channels, predictive analysis of audience behavior (e.g. lookalike targeting),…etc. Since audience data is in anonymous cookies profile, privacy of personal identities can be protected. To understand more, please contact DIGICOM, your Certified Digital Marketing Consultant. Please indicate your area of interest to receive our new market updates.